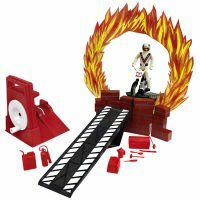 Evel Knievel, King of the Stuntmen, and his motorcycle that does all the great tricks Evel made famous. Slip the cycle into the energizer . . . wind it up and up . 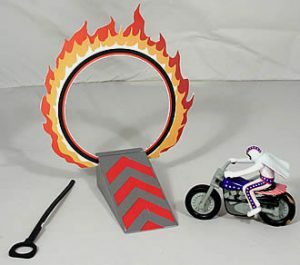 . . and suddenly Evel is off and away, racing 100 feet or more while he puts his bike through its daredevil paces, jumps, flips, and wheelies. 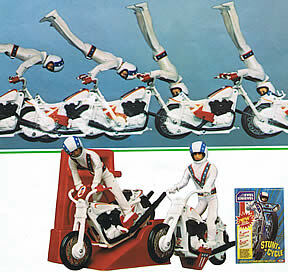 Never one to sit down on the job, Evel would rather stand on the seat or do a handstand on the handle-bars. 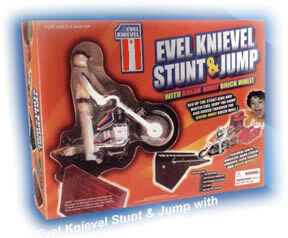 If Evel crashes, a shock-absorbing front fork helps keep him and his cycle out of trouble. 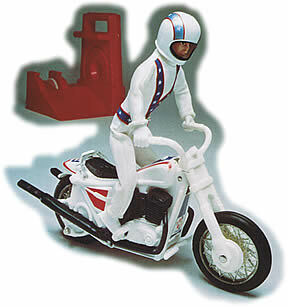 The one and only Evel, 7″ high, dressed for speed in his official uniform with removable helmet.